ditto. i have eight that i've been rotating and only had one issue the first time i ran them at a festival. i was definitely pushing them and over estimated runtimes. when in doubt, flip em anyway. I needed a low price gift for a X-mass swap. This will work nicely. Ill vote YES these work fine as well. I think Li-Ion batteries are better than NiMH because it holds and charge longer and can use in cold outdoor conditions. Also lighter and easier to carry. Anyone thought about using Li-Ion rather than NiMH? No - they're not "true" 9v. "Nominal Voltage 7.7V pack with a peak voltage of 8.4V "
I just got these, and I'll be using them in the nbox soon... iIt says on the battery packaging that there is no memory in them, which I suppose should mean you do not need to fully discharge them after every use. Can someone advise as to whether this truly is right? If not, any advice on how to discharge them? perfect. What do you think? Have you checked whether they give you the same amount of time in the nbox after a while? So what is the general consensus on these? Still the way to go? What charger are people using? The 4 channel MAHA or the 10 channel that Nick got? 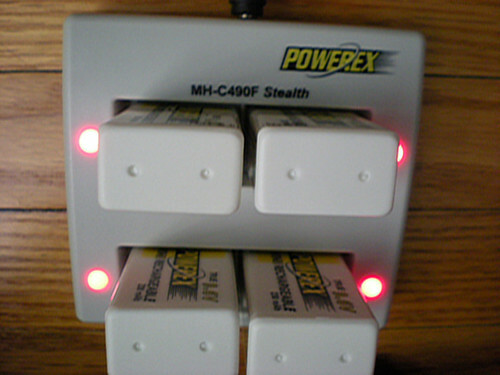 I have been using the 8 batts in rotation on and off of my MH-C1090F 10 batt charger and have been pleased by the results..I also like the idea of having the spare batts on hand at shows, so instead of swapping pairs I just change out the one pair with freshy's. After staring at a pile of 52 9V batteries on my desk, I finally broke down and bought one of these. I find it absolutely hilarious that the 4 channel MH-C490F model is called STEALTH! Too bad about all the red lights. Awesome post. I was just thinking about this today. I've got an N-box on order right now and was just looking at these exact rechargeables on newegg.com. It looks like I could get close to four hours on four of these running the nbox, which should be enough for the shows I go to(stealth--don't want to have to worry about another four batteries to swap out). I'll just have to make sure to turn the nbox off after each band when there is more than one band playing that I want to tape. Would new batteries give an even longer running time for the n-box? Not sure what you mean by new batteries. A new set of Duracell Procell 9Vs lasts 3.5 hrs on the change every show side. These 9.6Vs when freshly charged start at around 11.3V and last 4 hrs on the change every show side. After that they are around 10V, but I tried running them longer and after an hour they read 3V, so I would swap them after 3.5-4 hrs just like alkaline 9V.